If you stand far enough away, Rosi Garita’s paintings look like extremely stylized portraits of women. Each figure is richly colored and romantically posed, like the subjects of Gustav Klimt. The textures are sublime, and you could easily imagine each painting hanging in a funky little den. Garita’s series is handsomely displayed in the López Escarré Gallery in the café of the National Theater, the perfect décor for coffee and kibitzing. But look closer, and you’ll find that the women’s bodies are actually composed of hundreds of little faces. The faces are photographic, apparently snipped out of magazines and pasted onto the canvases. Everywhere a woman’s body is exposed, her skin is actually made of tiny human heads, like flesh-toned scales. The faces are young and old, showing every ethnicity, hairstyle and color. Look very closely, and you’ll see tiny constellations painted into the backgrounds. Whoa, nelly. You’d be forgiven for having no idea what Garita is talking about. Depending on your aesthetic eye, you may not even notice the constellations in her portraits, much less see them as a special bridge to the Celestial Universe. Generally, visual artists should refrain from trying to verbalize their intentions, and Garita is no exception. 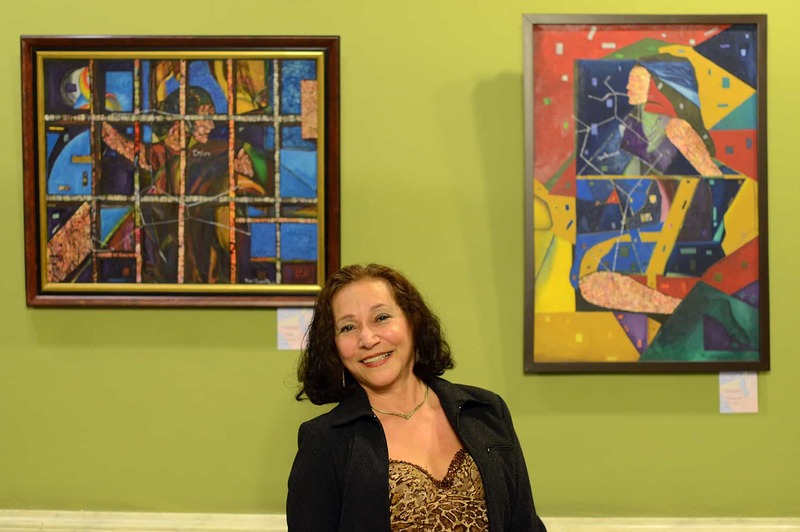 But Garita’s work speaks wonderfully for itself, and if you find yourself in the Plaza de la Cultura between now and October, you might consider spending some time among her paintings. The face-based skins may inspire two contrasting reactions. First, you might feel inspired, because they could represent the human family, or the proverb that it takes a village to raise a child, or the fact that only women can gestate life. On the other hand, you may also feel alarmed, because scores of faces are staring back at you, and at first you didn’t even notice them. Like a Magic Eye picture, the miniature visages appear all at once. They are so smoothly incorporated into the paintings that they make you feel as if you’ve unveiled a secret. Garita is Costa Rican and Canadian, and she is both an artist and a published poet. Most of her titles have mythic names, like “Pegasus,” “Phoenix,” “Andromeda,” and “Leo,” and the astrological references are clear. One of the most interesting portraits is “Scorpius,” which incorporates Chinese characters and what appear to be diagrammatical notes. Whatever her original objective, the paintings have a mysterious quality, as if, like the stars, each must be decoded for hidden meaning. Like great verse, a good painting get more complex the more you look at it. So get close. There’s always more to see. “Globalización Humana y Constelaciones” continues through Oct. 3at the López Ecarré Gallery, National Theater, downtown San José. Mon.-Sat., 9 a.m.–7 p.m. Free. Info: Gallery website.